Lately I’ve redoubled my efforts to include as many healing, happy-gut foods in my diet. Here are some of my current favourite meals and snacks for health and healing. It’s sad that fruit has a bad reputation (mainly due to its high fructose content), because it can really be so healthy. Bananas are easy to digest and they give you energy and heart-supporting potassium. I’ve also always found them extremely soothing to eat, especially when my tummy’s unhappy. 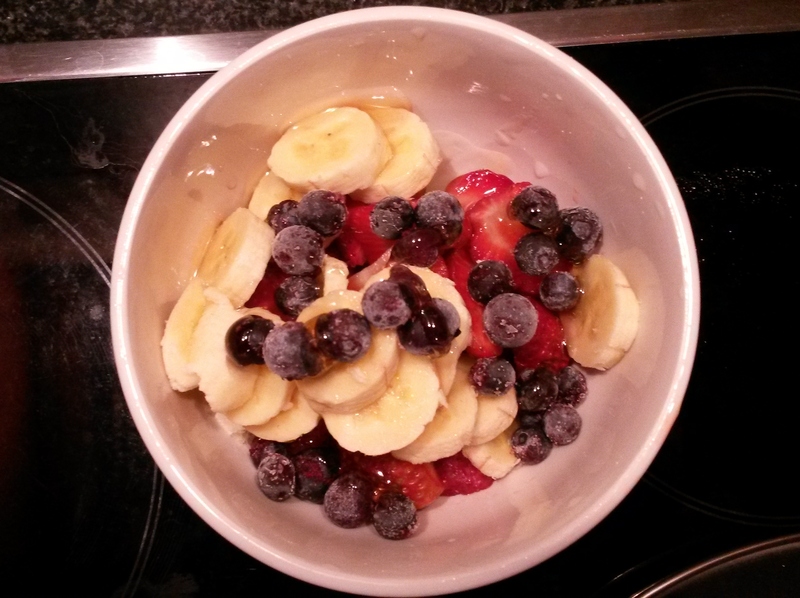 Strawberries give me a good dose of vitamin C and blueberries are known to help ease the symptoms of digestive diseases. A lot of healing diets forbid or discourage the consumption of eggs, but I’ve never personally had a problem with them. They’re full of protein as well as important vitamins and minerals. Spinach meanwhile is virtually a ‘superfood’ and I’ve really been trying to get it into my diet as often as possible. I actually feel like I’m slowly healing my body with each mouthful! Spinach is full of vitamins, and it’s even got Omega-3 fatty acids and anti-inflammatory antioxidants. It’s good for digestion and flushing out toxins, and I recently learnt that cooking spinach actually increases its health benefits because the body can’t completely break down its nutrients when it’s raw. 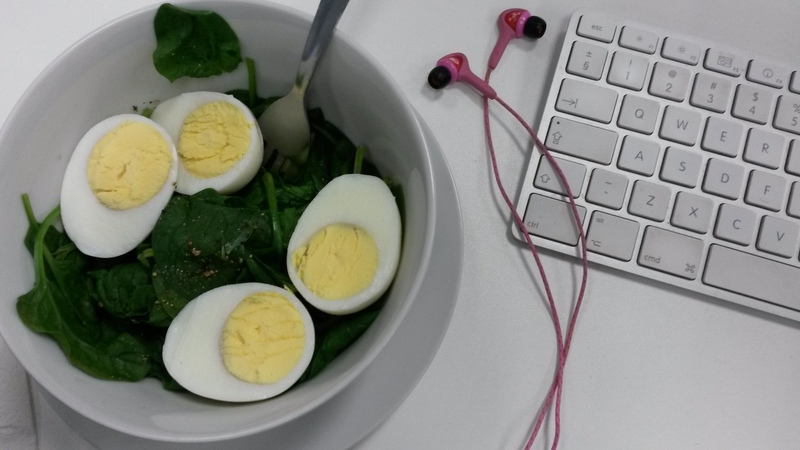 Music is good for the mind, body and soul, so include as much of it in your diet as you can. 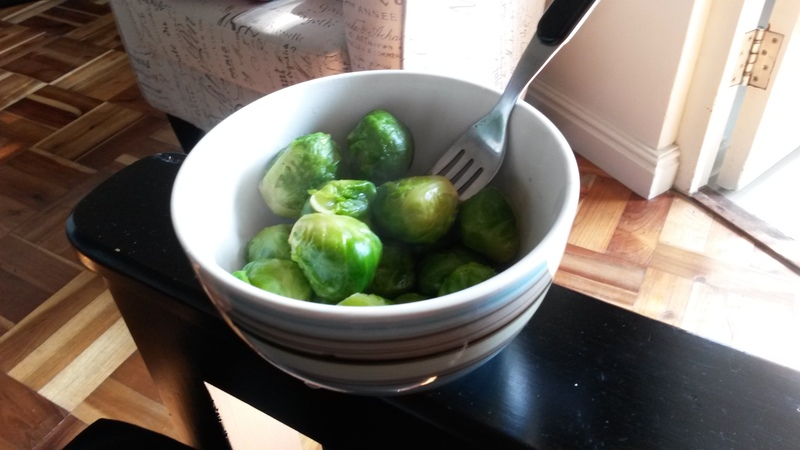 I adore Brussels sprouts (I know, it’s unusual!) and I can easily – and often do – eat bowls of them as snacks. Like most other veggies, they offer high doses of vitamins and nutrients, as well as their fair share of fibre. This means they can cause bloating and should be avoided if you’re flaring. Don’t cook your Brussels sprouts for too long or you’ll destroy the healthy bits! Three to five minutes is enough. So this is what my dinner plate looks like most nights. 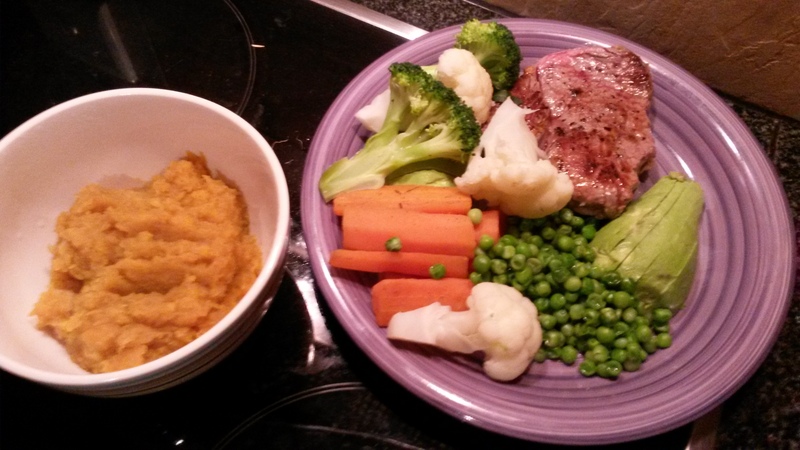 I take the 3/4 veggie rule so seriously that I usually end up with four quarters of vegetables on my plate and no space for the meat – hence the mashed butternut on the side! Starting with the butternut, it’s filling and easy to digest – it’s one of the first vegetables you can introduce on SCD, and I’ve always loved it and found it to be unproblematic. Carrots are the first veggie introduced on SCD, as they’re also generally very easy to break down. They’re also full of vitamins and minerals. Broccoli and cauliflower are cruciferous vegetables (as are Brussels sprouts, bok choy, cabbage and kale), which means they’re packed with phytochemicals, vitamins, minerals and fibre, and overall they’re just amazingly fabulous for your health. They also help support the functioning of the digestive tract (read this fascinating article about the healthy interaction between cruciferous vegetables and the bacteria in your gut). Most of us know that peas are a great source of protein and fibre – but did you know that they also have antioxidant and anti-inflammatory properties? Avocado is one of the healthiest fats you can add to your diet and its Omega-3 helps to reduce inflammation in the gut. My nutritionalist has recommended I eat it every day – that’s how healing it is! Lastly, lean red meat is obviously a protein source, and despite what detractors might say, it’s also one of the best sources of nutrients that you won’t get from plant-based foods. I’m not the biggest fish fan but I am trying to get it into my diet more often because it’s just so damn healthy. This is hake, which offers Omega-3 acids and a range of nutrients. I’ve cooked it in homemade coconut milk, which is another incredibly healthy fat that my nutritionalist recommends I consume daily, due to the fact that it’s so healing for the gut. As you can see, I’ve tossed in some handfuls of baby spinach for an extra health kick, and it’s seasoned with all the usual ‘legal’ seasonings like garlic and ginger – both of which are also considered ‘super foods’ due to their healing and health-sustaining properties. 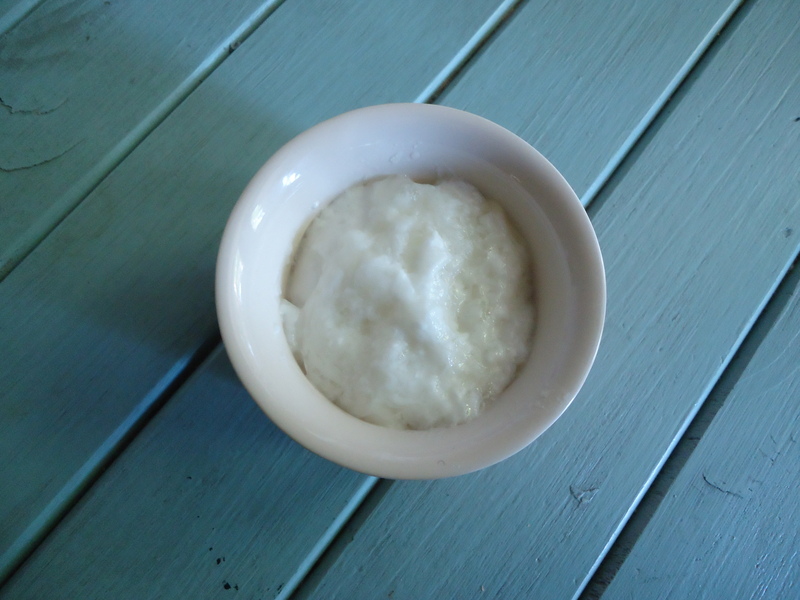 This is made from coconut milk, and has the added benefit of gelatine and probiotics, which are added just prior to incubating it. Probiotics introduce healthy bacteria to your gut and gelatine is an amazing weapon in the fight against inflammation. This is one of the healthiest things you can feed a damaged gut. 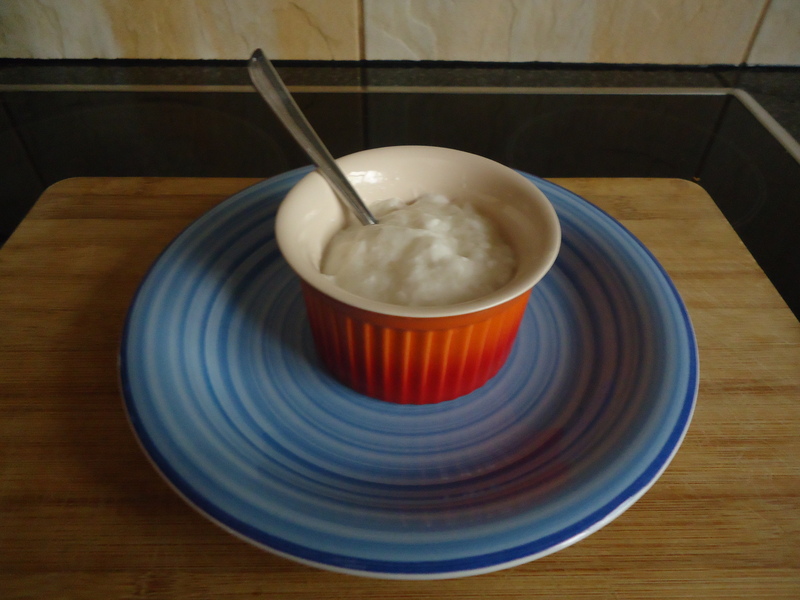 Here’s my recipe for homemade coconut yogurt. Okay so this was a bit of a splurge (I was celebrating signing my permanent contract at work), and champagne – or any alcohol for that matter – should be avoided when you’re flaring, or when you’re trying to heal your gut. 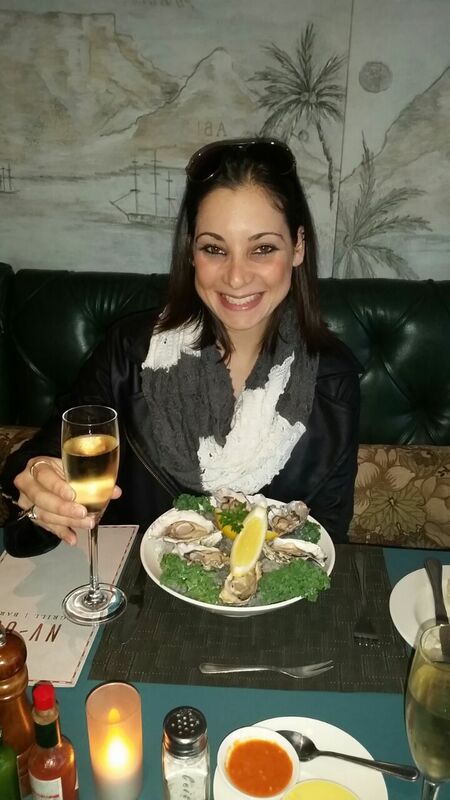 I was thrilled to discover some time ago that oysters, however, are so so good for you! They’re full of zinc, which is essential for those of us battling digestive diseases as we tend to lose a lot of it. Zinc is essential for healthy functioning and also helps to heal woulds. You’ll find it in pumpkin seeds too. Everyone needs to feel like they’re eating something fun every now and then – even those of us with IBD! This cauliflower pizza was made from many of the healthy ingredients listed above, so it has the added benefit of hitting that ‘junk food’ spot without actually being junk food! The olives and mushrooms are also sources of healthy fats and nutrients, and it’s all drizzled with coconut oil for that extra bit of healing. What are you favourite healing, healthy meals? My sister served us a delicious cauliflower soup yesterday, when she and her husband had the family over for Father’s Day. Feeling inspired, I decided to see what kind of soup I could come up with using ingredients I already had at home, and this was the result. 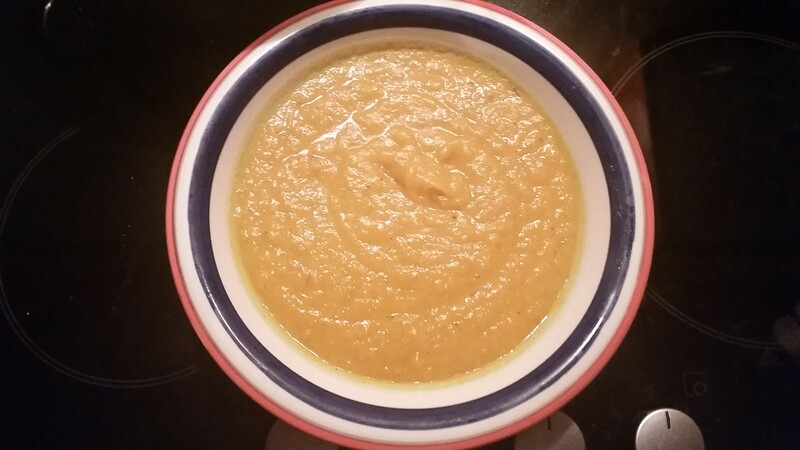 It’s tasty, filling, easy to make and totally budget friendly 🙂 Plus, K said that it tasted like ‘restaurant quality’, which is high praise considering that a) she hates butternut soups and b) we have amazing restaurants in Cape Town! This recipe can easily be made SCD-friendly by omitting the sweet potato. Simply add extra butternut. Place all the vegetables (except the ginger) on a roasting tray, drizzle with coconut oil and season with cinnamon, dried rosemary, mixed herbs and garlic salt. Roast for 30 minutes or until soft and lightly browned. 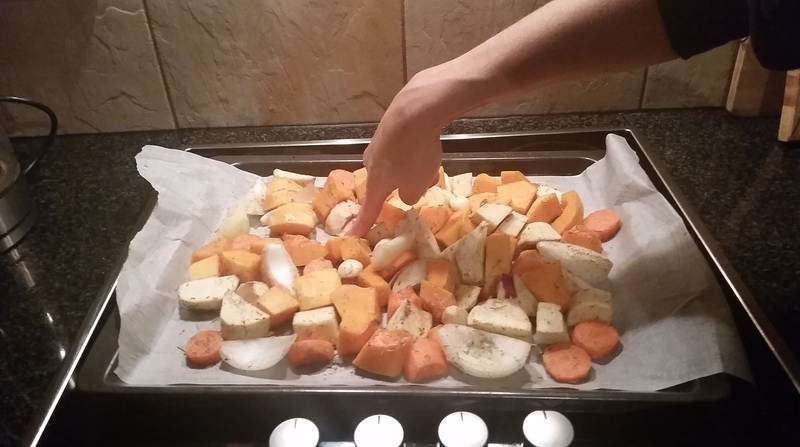 A trick I learnt recently: Run your finger along the bottom of the roasting tray after seasoning the veg, and then give your finger a lick. If it tastes good, so will the veg! Just before the vegetables are ready, place the ginger into a large pot and saute in a little water for 2 or 3 minutes. Add two cups of boiling water, plus the salt, pepper and bay leaves. Add the roast veg along with any juices/seasoning. Bring to a boil. Allow the vegetables to simmer, covered, for about 10 minutes. 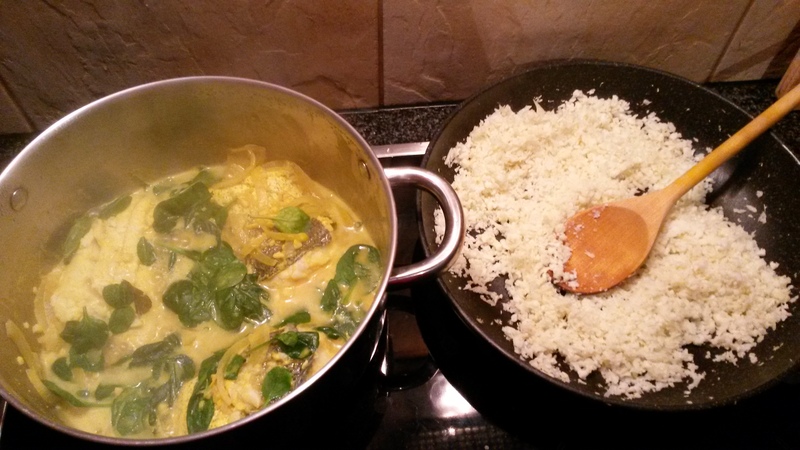 Remove from the heat, take out the bay leaves and add the coconut milk/yoghurt. Blend using a stick blender. Add a little extra boiling water if it’s too chunky to blend – I found that I needed another cup or so. Return to the heat for a minute or two before serving. Does it seem like I’ve made a massive leap from soggy broccoli and pureed carrots to proper gourmet meals? Ha! It feels like that to me… but the days have really flown on this diet. Over the past week I’ve realised that I can actually already make some pretty awesome dishes based on foods I’ve already introduced. That, combined with the fact that I’m slowly introducing the skin and seeds of well-cooked vegetables means that I have much more freedom to create exciting meals. 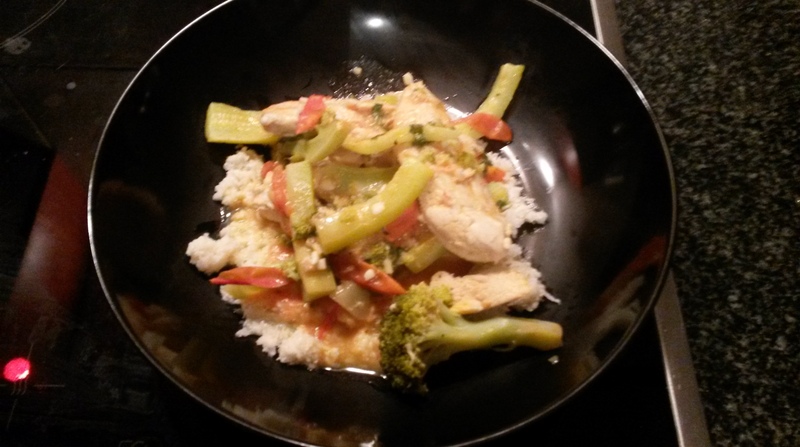 Tonight, I cooked a delicious chicken dish that I made up from ingredients I can already eat. 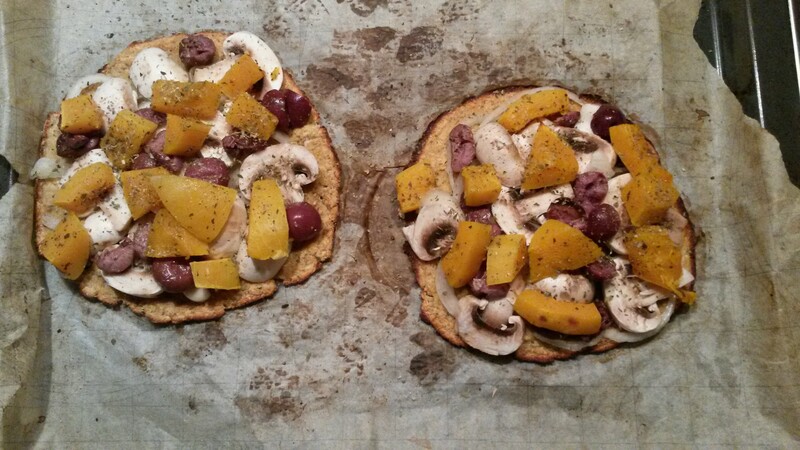 I can’t actually believe how good it was, so I’m going to share the recipe here. Season the chicken with salt and pepper and add to a pot with the garlic and all the juice from half the lemon. Add a little hot water and fry on med-high heat for about 5 minutes, until the chicken is no longer pink. 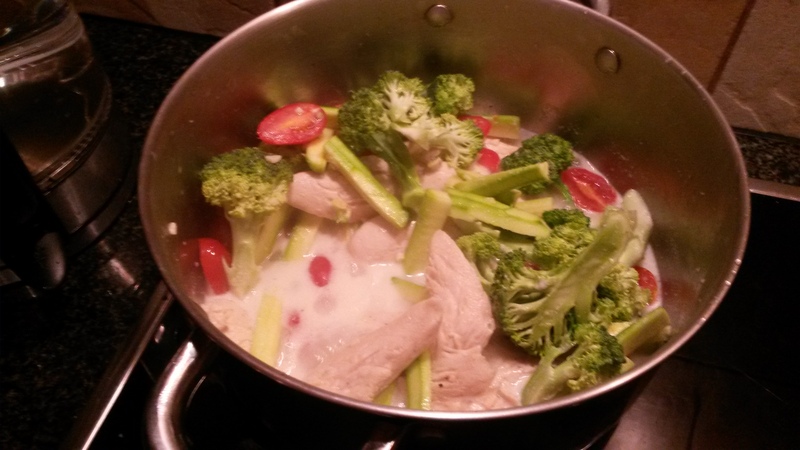 Add the coconut milk, ginger and vegetables to the pot and bring to a boil. 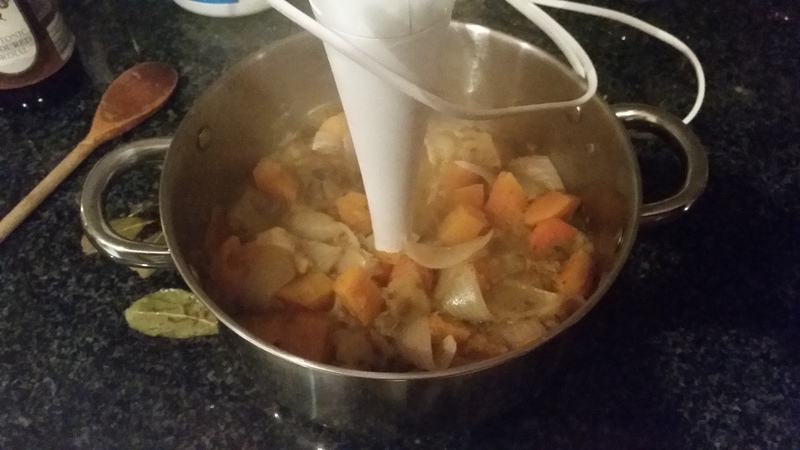 Reduce heat and simmer for about 20 minutes, until veg is tender and flavours are infused. While the chicken is simmering, ‘rice’ the cauliflower by grating it,then place it into a microwave-safe bowl and add a little water. If you like, sprinkle some lemon juice over it for extra flavour. Microwave for 10 minutes or until cooked. Just before serving, add the coriander to the pot and stir to incorporate. Serve the chicken over the cauliflower rice and garnish with extra coriander if desired. I also can’t wait to experiment with other foods and flavours. 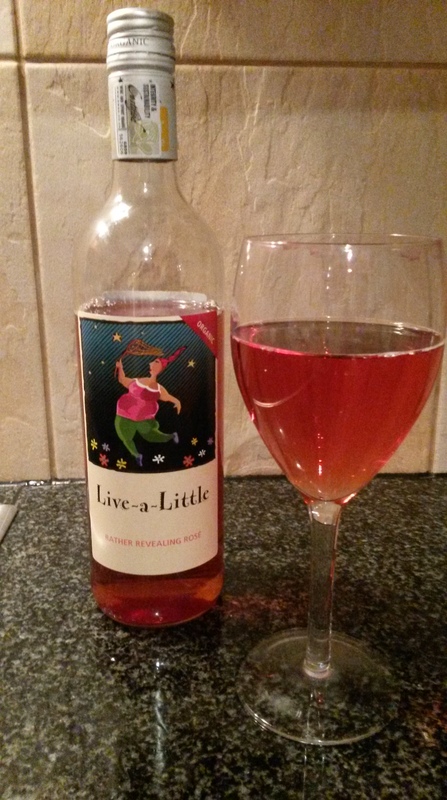 It’s so exciting to be creating completely SCD-legal dishes that are not only helping to heal my gut, but are totally yummy too 🙂 I served tonight’s meal with organic rose wine called Live a little. Appropriate, methinks!